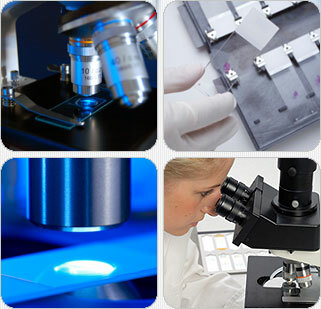 Thank you for your interest in TEKDON microscope slides. This page provides general information for international customers, like minimum order requirements, ordering info, payment terms, manufacturing lead times and shipping options. TEKDON regularly processes and ships orders to countries all across Europe, Peru and other Central & South American countries, Australia, Malaysia, Singapore and other Asia & Pacific Rim countries. Does TEKDON have distributors or distributor networks in different countries around the world? No, we prefer to deal with and sell directly to our customers. The minimum order requirement is 5 gross (144 slides per gross = 720 slides) at a cost of $59.00 USD per gross ($295.00 USD total) but if you purchase by the case which contains 10 gross (1440 slides) the price decreases to $45.00 USD per gross ($450.00 USD per case). The price for PTFE (Teflon™) printed slides with an adhesive surface chemistry within the well area(s) are $76.00 USD (5-9 gross) and $59.00 USD (10+ gross). I would highly recommend the adhesive surface chemistry if you're working with tissue sections, bacteria or cell lines that are difficult to adhere to the glass surface such as HEp-2 cells. The above prices and minimum quantity requirements are for each well formation, color print and surface chemistries. The microscope slide designs on this web site are how they would appear printed with BLACK PTFE (Teflon™) but you can choose a different color if you desire from the color chart in the MICROSCOPE SLIDES section. These are just a few examples of thousands of different well formations we manufacture. If you see one that will be suitable for your process, please provide us with the "SLIDE ID" number above the design along with your printed mask color preference. We can also custom produce them to your specifications. Please Fax (001 941 322 2880) or send a PDF file showing a sketch of the variation(s) you would prefer. All international orders must be paid in advance of production by VISA, MASTERCARD, AMEX, bank funds transfer or you can send a check payable in US Dollars to the address below. Current manufacturing lead times are approximately 2-3 weeks from receipt of payment and you'll receive your slides within 5 business days thereafter via USPS. There may be additional Customs and Duty fees due upon arrival. Please contact your countries Customs Department for further details. We have found that when shipping internationally that the postal service is the most economical but there are sometimes delays with the postal service getting packages through Customs. The major couriers UPS, FEDEX and DHL are more efficient with getting packages through Customs. If you would like us to use one of the major couriers, you will need to supply us with your shipper account number for third party billing, Customs and Duty fees. If you should have any further questions, please don't hesitate to contact us anytime. Question: Can you provide a Certificate of Origin for international customers? Answer: Yes, Tekdon can provide these certificates. We do not charge for them. The most common country we ship to that asks for them is Vietnam but can provide them for customers in other countries. Just let us know you need a certificate when you contact us or when you place your order. Contact Us about placing your International Order.